On February 11, ISIS published a report examining the status of Iran’s gas centrifuge program at the Natanz Fuel Enrichment Plant (FEP). The safeguards report of the International Atomic Energy Agency (IAEA) released on February 18, 2009 contains additional information about the performance of centrifuges at Natanz. 1 This supplement to the ISIS report of February 11 discusses the new information, updates several of the figures and tables in the primary report, and expands upon a number of the findings of the original report in light of the new information. For more information about the data and analysis underlying this supplement, please see the original report. The data in the latest IAEA safeguards report further support a central finding of the original ISIS report, namely that Iran is unlikely to deploy enough gas centrifuges to make enriched uranium for commercial nuclear power reactors for a long time, if ever. As such, one of the most striking lessons from reviewing Iran’s accomplishments at Natanz is just how unachievable a commercial enrichment program remains, while at the same time, how comparatively little enrichment capability is required for a nuclear weapons capability. After including declines in the number of P1 (IR-1) centrifuge cascades at Natanz, the FEP had 6,724 P1 centrifuges in 41 cascades being fed uranium hexafluoride or installed and ready to accept uranium hexafluoride. Iran has the ability to deploy many thousands more centrifuges at Natanz or another facility. Iran is unlikely to face significant delays in making weapon-grade uranium at Natanz if it decides to build nuclear weapons. Starting with natural uranium, Iran could produce enough weapon-grade uranium for a nuclear weapon in a year, although it may need more centrifuges to do so than predicted in earlier ISIS estimates. In a breakout scenario using low enriched uranium, Natanz could currently produce enough weapon-grade uranium for a weapon in six months or less. In this light, Iran’s recent decision to start producing 19.75 percent low enriched uranium (LEU) in the pilot plant from 3.5 percent LEU, ostensibly for civil purposes, is particularly troubling. If Iran succeeds in producing a large stock of 19.75 percent LEU, in a worst-case scenario, the FEP is large enough to turn this LEU into sufficient weapon-grade uranium for a weapon within a month. Its production could even occur between visits by IAEA inspectors, a time period that Iran could easily lengthen by positing some emergency or accident that requires a delay in permitting the inspectors inside the plant. Although the IAEA would later discover what happened, Iran may have only marginally violated its IAEA safeguards commitments by producing this weapon-grade uranium (Iran’s production of weapon-grade uranium by itself is not a safeguards violation, although its continued enrichment already violates several UN Security Council resolutions). Yet, it would have successfully used the FEP to secretly emerge with enough nuclear explosive material for a nuclear weapon. This worst-case assessment depends on Iran accumulating sufficient 19.75 percent LEU, an achievement not likely in 2010 but increasing in likelihood in 2011 and 2012. Although the most important goal is achieving a suspension of Iran’s gas centrifuge program as called for in multiple IAEA and U.N. Security Council resolutions, it is also vital to improve the safeguards at Natanz and drastically reduce Iran’s stocks of LEU. The original ISIS report concluded that the Fordow enrichment plant is capable of producing enough weapon-grade uranium for a weapon under conservative assumptions about the performance of the P1 centrifuges. Information in the recent IAEA report has strengthened this conclusion. This result confirms the Obama administration’s estimate that Fordow is large enough to produce enriched uranium for a weapons program. However, the discovery of Fordow eliminates its usefulness in producing weapon-grade uranium in a parallel secret program starting with uranium hexafluoride made outside of safeguards. Its potential role in a breakout strategy using 3.5 percent LEU is also diminished, since Iran is likely to want a secret site if it pursues nuclear weapons. A major unknown is how much dedicated enrichment capacity Iran has established in secret outside Natanz and Fordow. Available, albeit limited, evidence about clandestine activities, the discovery of the incomplete Fordow site, and the struggles Iran is encountering with cascades at Natanz would suggest that Iran has not completed a centrifuge facility operating with a nuclear-weapons significant number of P1 centrifuges. However, it may well be building one now. Thus, in 2010 Iran may be limited in its ability to produce weapon-grade uranium outside of the Natanz site, either in a breakout mode using its existing stock of LEU or in a parallel effort starting with natural uranium. The number of centrifuges installed and being fed with uranium hexafluoride decreased in the last few months to a total of 6,724 centrifuges. As of January 29, 2010, the number of centrifuges being fed uranium hexafluoride fell to 3,772 P1 centrifuges from 3,936, a decrease of one cascade, or from 18 to 17 cascades. In addition, a total of 2,952 P1 centrifuges were under vacuum or installed and thus ready to accept uranium hexafluoride. Figure 1 summarizes the number of centrifuges at the FEP since 2007. In a new development reported in the IAEA safeguards report, Iran disconnected a number of centrifuges in 11 cascades in the A26 module. (These 1,804 centrifuges are not included in the total above.) This module is the one that experienced decreases in the number of cascades being fed uranium hexafluoride in 2009. In addition, centrifuges in two cascades in the A28 module, which had not yet been fed any uranium hexafluoride, were removed or were in the process of being removed. The IAEA report is silent on the reason for these decisions; and Iran is not obliged to explain its rationale to the IAEA. But this action could imply that these cascades did experience significant problems, as discussed in the original ISIS report. Alternatively, Iran could be in the process of moving at least some of these centrifuges elsewhere. The IAEA report implies, and senior officials close to the IAEA reiterate, that Iran does not appear currently focused on increasing the total number of centrifuges at the FEP. It may be dealing with unexpected problems in its cascades or shifting its priority to finishing the Fordow facility and other unknown enrichment sites. This LEU is in the product tanks or in cold traps associated with those product tanks, but it does not include the amount of slightly enriched uranium in dump tanks, which are on the product side of the cascades and receive material not desired in the product tanks, as described in the February ISIS report. This quantity includes about 1,000 kilograms of slightly enriched uranium (one percent or slightly higher). It is mostly recoverable and available for further enrichment. The recent period witnessed an increase in the average amount of uranium hexafluoride introduced into the cascades. Figure 3 plots the historical average amount of feed entering the cascades. Figure 4 compares the monthly average amount of feed and LEU to the midpoint of the number of cascades operating in the reporting period. As can be seen, the feed and the LEU output are in line and increasing, which implies better performance during the most recent period. Figure 5 shows the average estimated annualized separative capacity during the recent reporting period compared to earlier reporting. Based on the Iranian LEU estimate, the annualized separative capacity has reached about 3,400 swu per year, compared to about 2,500 swu per year during earlier periods. Assuming all 3,772 P1 centrifuges are operating, then each machine is achieving an average of 0.9 swu per year (see also table 1). As noted in the original report, this average value is likely an underestimate because some of these centrifuges are not operating. The average in the last reporting period was about 0.6 swu per year per P1 centrifuge. This increase demonstrates that the average separative capacity of centrifuges in the FEP is not fixed and can be expected to improve as Iran gains more experience in cascade operations. The FEP appears to be operating better than in 2009. If the Iranian LEU estimate is accurate, Iran seems to have managed to reach a new high in average LEU production. But an increase in LEU output in only one reporting period does not necessarily mean that FEP’s enrichment performance has significantly improved, particularly with so many centrifuges being inexplicably disconnected at the FEP. Data from future reporting periods will ultimately settle this question. Iran could use the cascades at the FEP to produce weapon-grade uranium by step-wise increasing the enrichment level to weapon-grade uranium, as described here. Thus, if Iran wants to produce weapon-grade uranium, it would have an interest in producing 19.75 percent LEU from 3.5 percent LEU, which is the second of four steps to weapon-grade. The next two steps would go from 19.75 to 60 percent enriched, followed by one from 60 to 90 percent enriched, where 90 percent enriched is weapon-grade uranium. Each step requires significantly less enrichment effort or time to complete the step. For example, once Iran has reached 19.75 percent LEU, it is 90 percent of the way in terms of enrichment output (separative work) to weapon-grade uranium. If Iran started with natural uranium and used all 3,772 centrifuges operating at the level of 3,400 swu per year, it could make about 22 kilograms of weapon-grade uranium a year, assuming a tails assay of 0.5 percent. If 3.5 percent LEU were used, these centrifuges could make 105-130 kilograms of weapon-grade uranium per year, where the tails assays are taken as 1.0 and 1.7 percent, respectively. If 19.75 percent LEU were used as feed, these centrifuges could produce 350-680 kilograms of weapon-grade uranium per year, where the tails assays are 1 and 10 percent, respectively. The over-riding constraint on the last two estimates is the availability of feed material. As can be seen above, the choice of a higher tails assay can significantly increase the rate of weapon-grade uranium production, but that increase comes at the cost of the need for significantly more feed material. Iran does not have enough LEU to maintain these rates. Iran currently possesses slightly more than 2,000 kilograms of 3.5 percent LEU and only hundreds of grams of 19.75 percent LEU. The former is sufficient to make enough weapon-grade uranium for one to two nuclear weapons under the above scenarios. But these calculations show how fast Iran could produce enough weapon-grade for one nuclear weapon if it accumulates sufficient LEU stocks—several months with 3.5 percent LEU versus a month or less with 19.75 percent LEU. These last calculations show just how close Iran would be to having enough weapon-grade uranium for a weapon if it develops a significant stock of 19.75 percent material. Iran could make this weapon-grade uranium from this material at Natanz in-between visits by IAEA inspectors, who are not continuously at the Natanz site. It could also rapidly remove this weapon-grade uranium to protect it from military strikes. These calculations currently involve a worst-case scenario. They assume Iran has enough 19.75 percent LEU and has minimized the time to modify its centrifuge operations and start making weapon-grade uranium. This situation becomes more realistic as Iran improves and expands its capabilities and increases its stock of LEU. In approximately one to two years, Iran would have a greater chance of successfully carrying out this strategy of rapidly producing weapon-grade uranium from 19.75 percent LEU at Natanz. This strategy is different from a traditional breakout strategy, where Iran removes the LEU from safeguards and moves it to a secret site for further enrichment. In that case, it may use fewer centrifuges, say 500-1,000 P1 centrifuges, and produce the material in less than six months. The longer time frame of six months in the case of 19.75 percent LEU feed assumes that Iran would have produced less of this LEU and would therefore be forced to use a relatively low tails assay to conserve material and additionally would encounter reliability or performance problems in its centrifuges. A disadvantage of this approach is that Iran would have to reveal its intentions to build nuclear weapons before it has weapon-grade uranium, since the IAEA would see the diversion of the LEU. An advantage is that the production of weapon-grade uranium would occur at a site Iran works to conceal from military strikes, whether through aerial bombardment or commando ground strikes. As mentioned in a previous ISIS report, building and maintaining the secrecy of a 500-1000 centrifuge plant would be relatively easier than doing the same for a 3,000 centrifuge plant, like Fordow. In addition, this clandestine site could continue to produce weapon-grade uranium for additional nuclear weapons. Thus, if Iran seeks a nuclear weapons arsenal, it would likely want secret centrifuge sites in any case. But it might want to invoke a strategy of rapidly producing weapon-grade uranium at Natanz, or for that matter at Fordow, while maintaining safeguards as long as possible in order to maximize speed and reduce the effectiveness of any military strikes. In its most recent safeguards report, the IAEA released part of its results gathered in its 2009 Physical Inventory Verification (PIV) at the FEP (see Table 2). By subtracting the values from the 2008 PIV, the result is the amount of material added in the period from November 23, 2009 to January 29, 2010. Small amounts of LEU may have been sent elsewhere, but these quantities are ignored here. From November 23, 2008 to November 22, 2009, Iran produced approximately 969 kilograms of 3.5 percent enriched uranium (seeTable 3). This is higher than a comparable Iranian LEU estimate, namely 924 kilograms of LEU for roughly the same period. The two values are close, differing by 45 kilograms or less than 5 percent of the total. However, Table 2 shows that the time periods do not exactly overlap, with the PIV period being about two weeks longer than the period for the Iranian estimates. During this two-week period, the Iranian LEU value would likely have increased by about 40 kilograms, based on earlier LEU production of about 85 kilograms per month (see Figure 2). Nonetheless, the difference between the two values is relatively small, even if one ignores the additional LEU produced during this two-week period. As a result, ISIS did not correct the values in the other tables and figures for the periods covered by the 2009 PIV, as ISIS did for 2008 values. In that year, the difference was significantly larger due to an error in the Iranian calculations of LEU production. Some may claim incorrectly that the most accurate estimate of LEU production is the IAEA measurement of the amount of LEU off-loaded into product cylinders, or 814 kg (see table 2). The IAEA takes these measurement in-between PIVs. The measurements do not include the LEU in the cold traps. Despite being underestimates of total LEU production, these measurements help the IAEA achieve their safeguards objectives at the FEP. The 2009 PIV measurement for the LEU is 155 kilograms greater than the combined IAEA measurements of the amount of LEU off-loaded into product cylinders. The periods again do not overlap, so the difference would be less if the periods were identical. 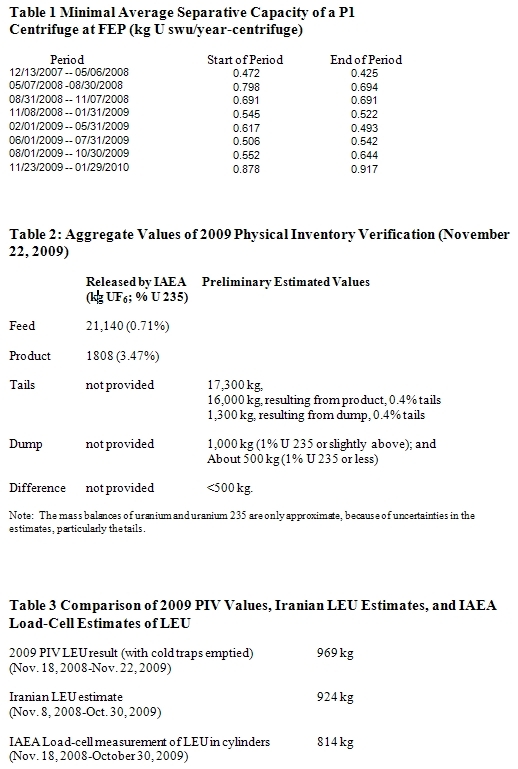 In 2009, the PIV shows that the Iranian estimates of LEU production were more accurate than the IAEA measurements of LEU off-loaded into cylinders. It is worth noting that the amount of natural uranium, or feed, measured in between the PIVs is accurate because it represents all the uranium introduced into the centrifuge modules. Iran’s centrifuge program is still in development. It is unrealistic to expect its program to remain static – an enrichment program is intrinsically based on improving the separative capacity of its centrifuges. In the most recent reporting period, the FEP has fewer centrifuges being fed uranium hexafluoride but is producing more LEU in these fewer cascades. The overall separative capacity of the centrifuges being fed uranium hexafluoride has increased. The IAEA does not know why Iran is disconnecting centrifuges in the A26 module. Is it fixing or renovating them, or is it moving them to another site? The same is true for cascades in the A28 module. Iran is likely to continue concentrating on improving its LEU output at Natanz, developing more advanced centrifuges, building the Fordow enrichment plant, and constructing additional enrichment plants. Iran is expected to continue seeking equipment, materials, and technology abroad for its centrifuge effort. Disrupting these efforts through increased vigilance on stopping illicit trade of dual-use goods can delay its centrifuge program and prevent the transfer of knowledge that could help Iran solve its problems in building and deploying not only the P1 centrifuge but more advanced ones as well. In the end, Iran is capable of solving its immediate centrifuge problems either by improving the output of the P1 centrifuge or building more of them, or both. In the medium term, it can also deploy more advanced centrifuges. But as long as Iran is under international sanctions, it is likely to face problems in expanding its centrifuge operations to provide sufficient LEU to fuel a commercial nuclear power reactor. Iran’s goal of a large domestic enrichment capability is driven in part by a fear of foreign suppliers cutting off LEU fuel for its nuclear power reactors. However, these very sanctions, worsened by Iran’s lack of cooperation with the IAEA, are making it impossible for Iran to create that enrichment capability. While it struggles with its commercial goals, Iran is strengthening an enrichment capability able to produce weapon-grade uranium for nuclear weapons. The number of ways it can do so is also increasing. If Iran develops a stock of 19.75 percent LEU, it could even use Natanz’s FEP to quickly produce weapon-grade uranium before the international community could respond. Unless IAEA safeguards inspectors are stationed at the FEP far more frequently, the international community may not learn about the weapon-grade uranium production until it already had left the site. 1 Report by the Director General, IAEA, Implementation of the NPT Safeguards Agreement and relevant provisions of Security Council resolutions 1737 (2006), 1747 (2007), 1803 (2008) and 1835 (2008) in the Islamic Republic of Iran, GOV/2010/10, February 18, 2010. 2 For the period November 23, 2009 to January 29, 2010, the IAEA measured the mass of LEU in feed and product cylinders. For this period, the amount fed into the cascades was 2,516 kilograms and the product cylinders held 159 kilograms of LEU hexafluoride. This LEU measurement is expected to be lower than the Iranian estimate of 257 kilograms LEU hexafluoride because the IAEA measurement does not include LEU in cold traps, which had been emptied as part of the November 2009 physical inventory verification and would be refilled as enrichment restarted. The difference of 98 kilograms between the Iranian total production estimate and the amount measured in the product cylinder is consistent with this explanation but appears on the high side of expectations based on similar data in 2009.